Fennel is a white, bulb-shaped root vegetable that grows with lovely fronds (the fronds look similar to dill). Maybe you haven’t ever heard of it, or maybe you’ve heard that it tastes like licorice and were scared away from trying it (try roasting it!). But fennel is an excellent source of vitamin C, potassium, and fiber; provides wonderful antioxidants; and is even thought to have anti-inflammatory properties. Fennel is a wonderful vegetable because the bulb, stalk, and fronds are all edible and delicious! I often buy mine at Trader Joe’s, which sells it simply in a package with two bulbs. Recently, I tried a new roasted vegetable recipe for the winter. It was so delicious that I think it would make anyone love fennel – and was super easy to put together! Remember – roasting is not an exact science, so it’s even easier than other recipes. 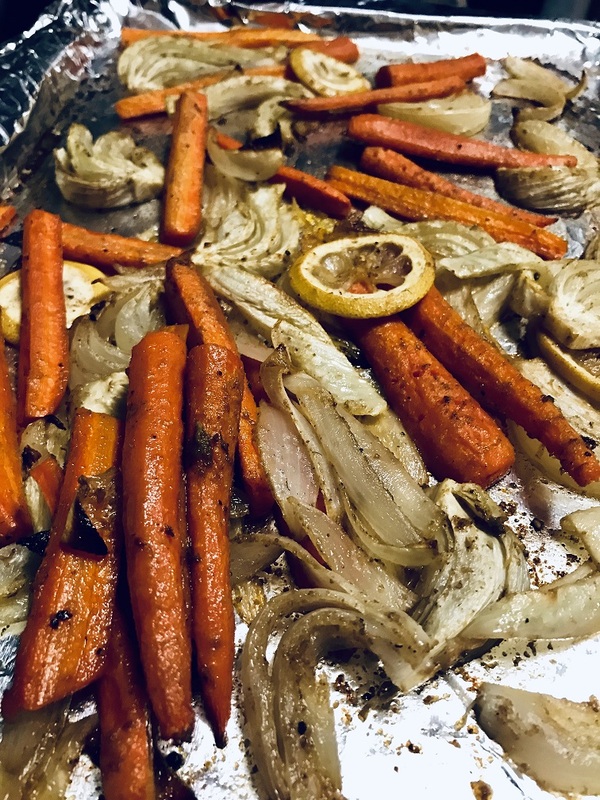 I switched out the red onion for a yellow one because it’s what I had on hand, and I only had a 1lb bag of carrots, so I used that instead of the full amount called for. Enjoy! In a large bowl, combine carrots, fennel, onion, and lemon. Mix oil, coriander, cumin, salt, and pepper; drizzle over carrot mixture and toss to coat. Transfer to two foil-lined large baking pans. Roast 40-50 minutes or until vegetables are tender, stirring occasionally. 1 serving: 139 calories, 7g fat (1g saturated fat), 0 cholesterol, 262mg sodium, 18g carbohydrate (9g sugars, 6g fiber), 2g protein.